The Rewind is a barrier-free spa that has recently joined the Pure Collection. Many of our customers have asked for a spa that has full seating and freedom of movement. We presented this challenge to our awesome design department and the Rewind is what they delivered. 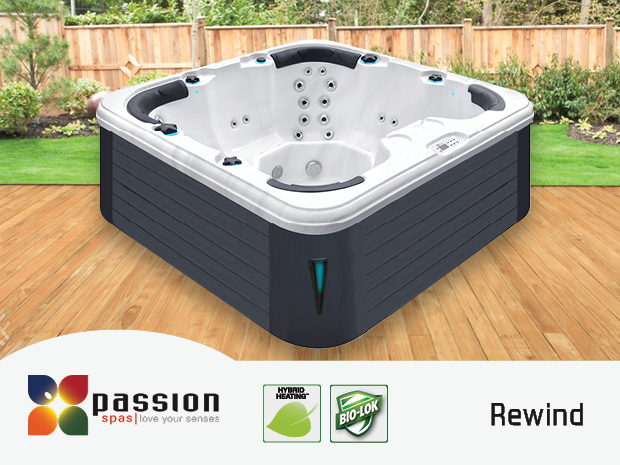 As you can see, it is “mission accomplished,” as the Rewind is very spacious, with 90 cm height, yet retains all of the massage and therapy functions that are inherent in a Passion Spa! In addition to a nice variety of 56 high-performance massage jets, the Rewind includes Hybrid Heating, Led Lights, BioLok, Energy Efficient Filtration Pump, Ozone Generation, Aromatherapy, Soft Air Massage System, Walk-on Cover and soft head rests… everything the Pure Collection is famous for!